The nearest underground stations are Oxford Circus (on the Bakerloo, Central and Victoria Lines), Bond Street (on the Jubilee and Central lines), and Great Portland Street (on the Hammersmith and City, Circle and Metropolitan lines). 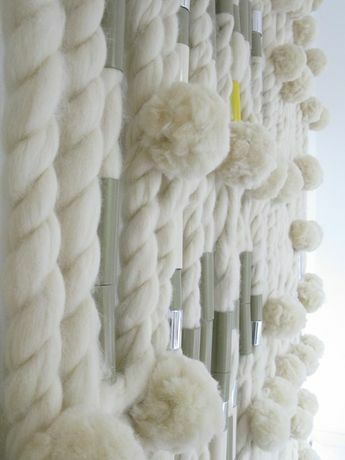 Wool Works is comprised of two large-scale hanging textile works crafted from natural wool and aluminium. Through making these works, Craftwork has focused on building bridges between the disciplines of art, craft, design and fashion. Using aluminium and natural wool top slivers, each screen is a collection of long hanks of hand-made wool which has been twisted into rope. These rope strands are bound together by combining knotting and powder coated and mirrored aluminium tubes. Craftwork's signature Pompoms punctuate the woven macramé knots. These beautiful works present strong visual interplay between graphics, materials and textures whilst fusing large-scale textile design with jewellery.